The Rhodope Mountains have today officially become a part of the Rewilding Europe initiative, after a period of intensive preparations for it within the region. – “The Rhodope Mountains are located southeast of Bulgaria’s capital Sofia. It is a very beautiful area and it is one of Europe’s real biodiversity hotspots, with huge rewilding potential,” explains Stoycho Stoychev, Conservation Director of the Bulgarian Society for the Protection of Birds and a member of the Rewilding Rhodopes team. The area is also connected ecologically to the extensive wild lands south of the border, in Greece: the slopes of the Rodopi and Orvilos Mountains. Towards the west, the Rhodopes reach to the wild Northern Pirin and Rila Mountains, with their famous Pirin and Rila National Parks. ­ – ”This entire region forms the core of the Rila-Rhodopean Mountain Massif – the largest, compact mountain formation in the Balkans, extending over more than 40,000 km2 (4 million hectares). However, during the first years of working in this area, our activities will mainly be focused on the eastern part of this mountain range (‘Eastern Rhodopes’), which is about 1.4 million hectares in size,” continues Stoycho Stoychev. – “Based on a 10-year vision, the rewilding work will focus on letting nature in the Rhodopes again more be shaped by nature’s own ways, the natural processes, and particularly so by allowing for natural grazing, carnivory and scavenging to be back and drive the system”, says Frans Schepers, Managing Director of Rewilding Europe. “Delivered through the local native key wildlife species – fallow deer, red deer, wild living horses, wolves, brown bears, several vulture species (black vulture, Egyptian vulture and griffon vulture), a high number of raptor species and the small-sized but extremely important Souslik or European ground squirrel”, he continues. In addition to supporting this wildlife comeback, there will be work done to protect the remaining old-growth forests and to promote much more natural management regimes in the protected areas and hunting concessions. There will also be a lot of work done to support the local entrepreneurs in their efforts to connect their businesses with wildlife, wild nature and wilderness. Within the area, four priority areas have been selected where the rewilding work will start off: Chernoochene, Madzharovo, Studen Kladenets and Byala Reka. – “We hope these priority areas, in total some 100,000 hectares, can then serve as practical and inspirational examples for the wider rewilding landscape in the region”, says Stefan Avramov, Rewilding officer at Rewilding Rhodopes. The concept of rewilding is already quite well known in this area. The efforts here will build on the experiences from and achievements by the New Thracian Gold (NTG) project, which was active in the Eastern Rhodopes between 2009 and 2014, where ARK Nature and the Bulgarian Society for the Protection of Birds (BSPB), were the key partners. Among its main achievements to date can be mentioned the successful reintroductions and restocking of large grazing mammals like red deer, Tarpan horses, Karakachan horses and fallow deer as well as a grazing experiment with European bison. This has led to around 55 Tarpans now roaming freely in two sites, and more than 50 fallow deer and 20 red deer roaming three sites here. The NTG project also produced an Eastern Rhodopes nature travel map, a Nature Travel Guidebook for wildlife lovers (Crossbill Guide) that covers both the Bulgarian and Greek parts of the Eastern Rhodopes) and a Trans-Rhodope biking & hiking tourist map, all in order to promote the area as a quality nature tourism destination. A foundation, called ‘Rewilding Rhodopes’ will be the local legal entity responsible for the rewilding work in the Rhodope Mountains. It will be a transformation of the New Thracian Gold – Bulgaria Foundation, with a new local board but largely the same core team of experts involved. 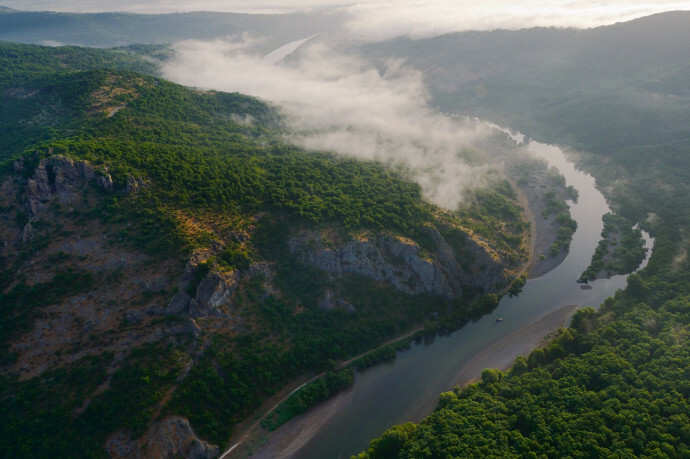 With Rhodope Mountains as its 7th area, Rewilding Europe moves another step forward towards its target of establishing 10 magnificent rewilding areas across Europe by 2022.